Are you visiting Leicester soon? 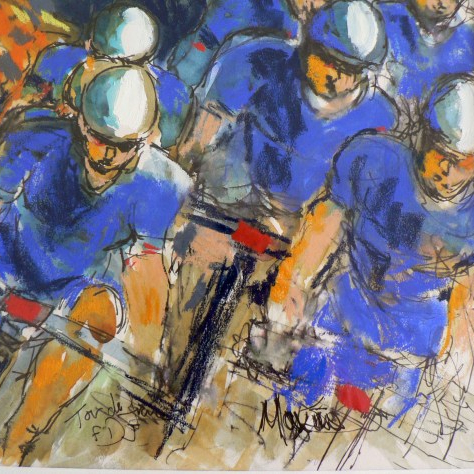 If you are a cyclist and you follow ‘Racing Lines’ I would be thrilled to bits if you can come to see my pictures on show in two locations in the City – the New Walk Museum and Cank Street Gallery. You will also be rewarded with views of the best parts of the city, the New Walk and St Martins square – lovely coffee shops and restaurants. You can make a day of it if you fancy. These three pictures are in the Leicester Society of Artists show which runs until 9th December. Mine are numbers 69, 70 and 71… which will help you to find them! Click here for info about the New Walk Museum. To purchase a painting, call 0116 225 4900. In between the two, you will also find this year’s annual exhibition by the Leicester Sketch Club, a great show running at the Old Library building on Belvoir Street. Click here for all the details. If you are able to come along and support our favourite sport in art, it would be great. I think it is long overdue!